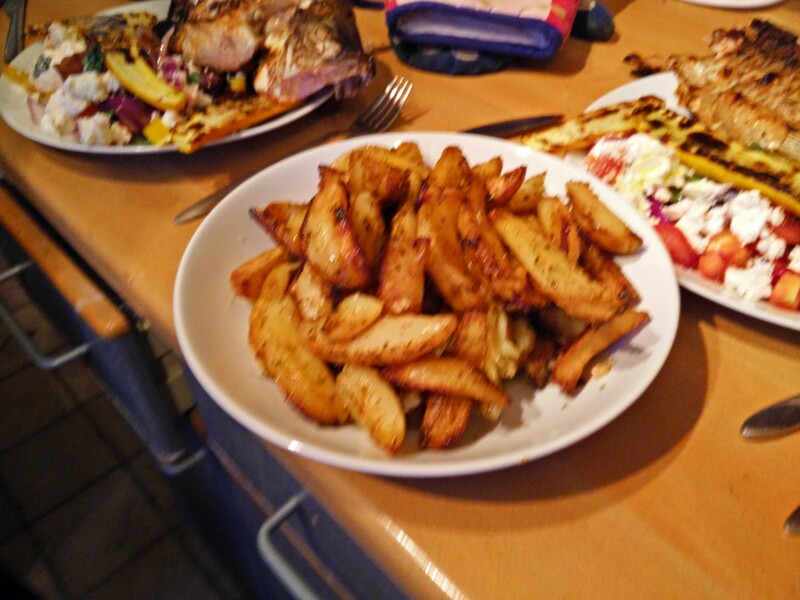 On holiday we always enjoy having fresh grilled fish, with Greek potatoes and Greek salad. As it’s a nice day today I’m going to get the barbecue out and try and recreate that meal at home. I popped down to Catford on my bike to the fishmongers, hoping to get a couple of sea bream, as that’s what we have in Greece. However the sea bream they had way rather small. I could have got four for a tenner, but they wouldn’t have been great on the barbecue, so I ended up getting yellow croakers. Unfortunately it turns out these aren’t great for grilling as they’re rather delicate. 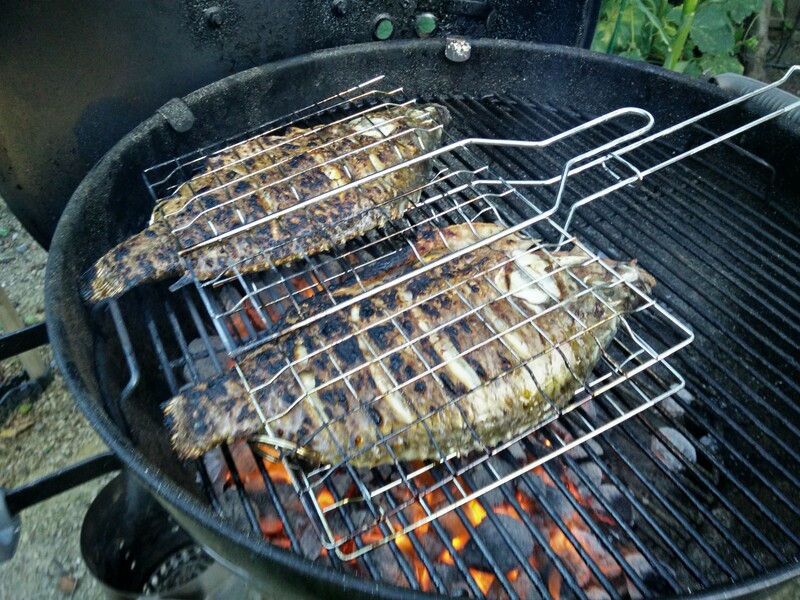 Thankfully I happen to have bought a barbecue cage recently because it was on special offer, and it turned out to be just the thing I needed! 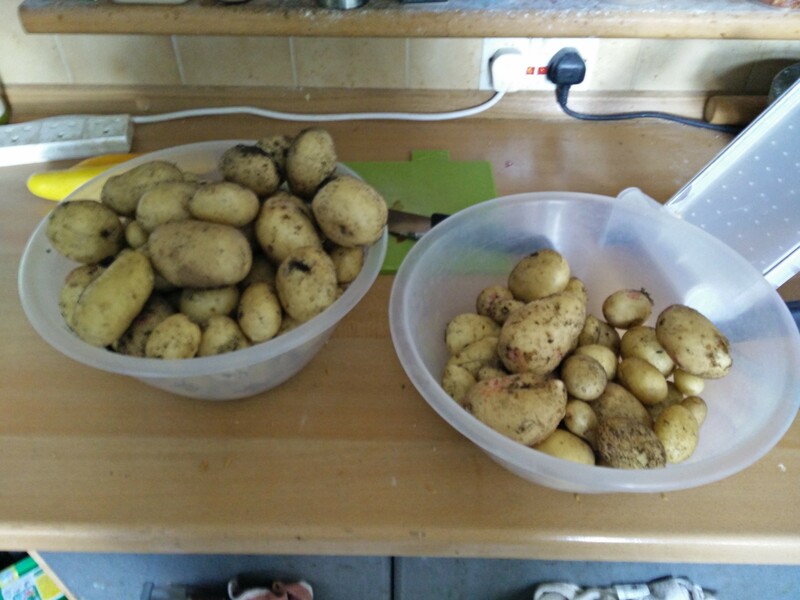 Coincidentally today was the day when I harvested this years potato crop. Unlike last year’s meager crop from grow bags, this year’s crop grown in the compost bin was much better, so I’m using those for the Greek potatoes. The recipe I was originally going to use from The Mediterranean Dish turned out to be a bit odd when we looked into it: paprika and Parmesan!? 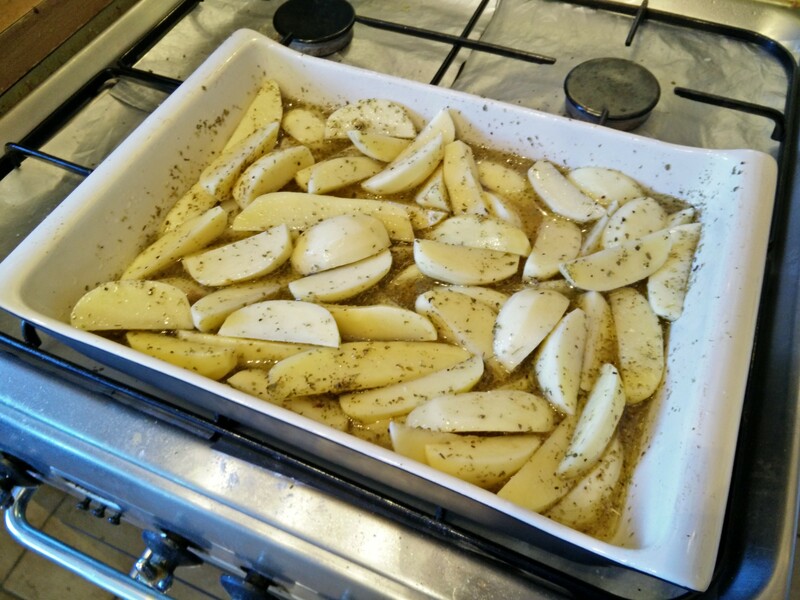 No no no that’s not Greek potatoes! So Soph found a better recipe from Food.com. 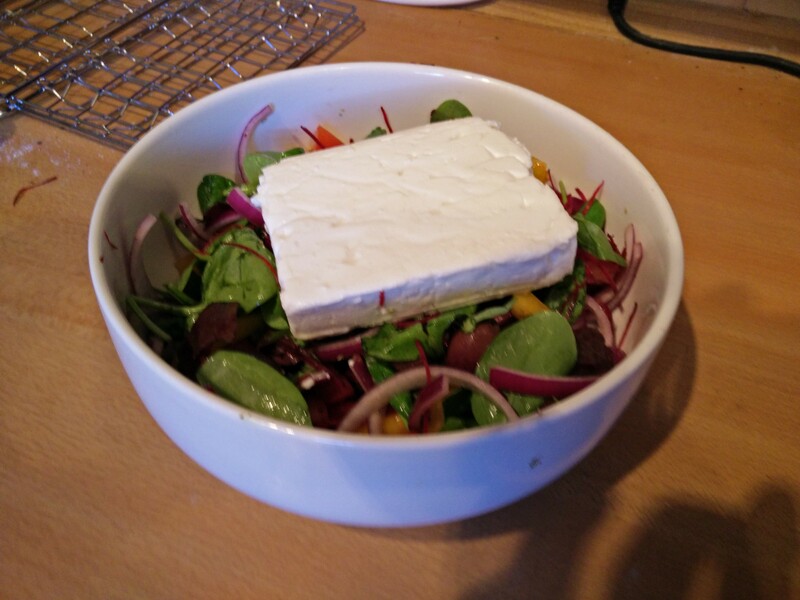 The Greek salad had a few salad leaves thrown in as they were going unused in the fridge. 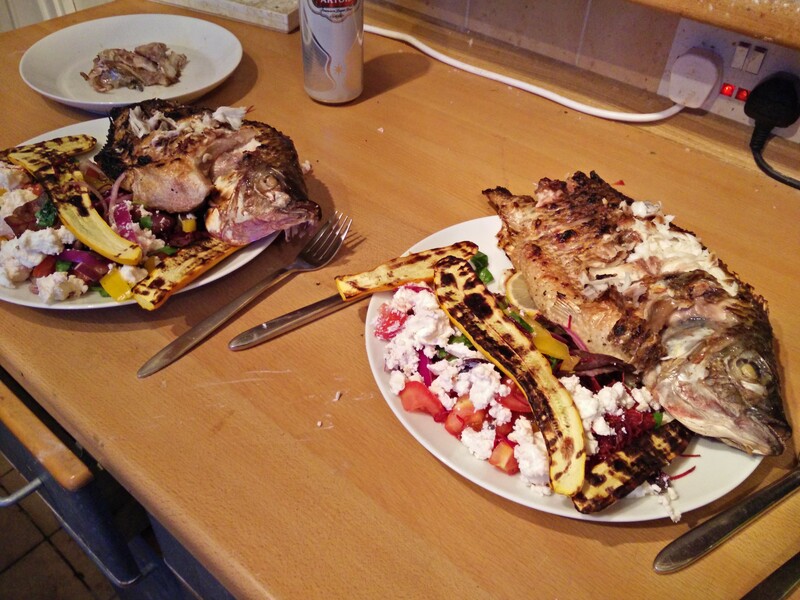 The final dish had some yellow courgettes from the garden, also grilled, to finish it off. Your barbeque cage for turning the fish was handy. I’ve never come across yellow courgettes – they make a nice change. Another healthy meal.